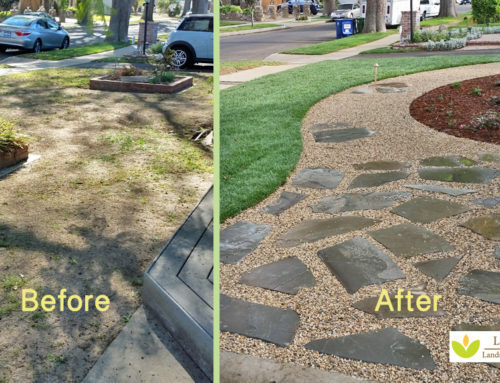 Yard Touch-up with Landscape Color - Linda Vista Landscape Services, Inc. Installing landscape color and hardscape (like pavers or flagstone) can make all the difference when you are considering adding value to your home. At this secluded West Hollywood home (Los Angeles area), the resident was looking for eye-catching upgrades that would add beauty to an already well-landscaped outdoors. In the fountain area, flagstone was placed to create a walkway to the side of the house and extended as an artistic circle around the bottom of the fountain. Mexican pebble was used as filler around the flagstone, as well as small foliage at the base. Flagstone is considered a luxury stone, and it adds immediate value to your home when installed in a quality way. Plants with color were poked into the existing landscape to draw the eye forward. And the planter areas were heavily mulched as a refresh. New grass was installed as a fresh start to the front yard. On the other side of yard near the driveway, a flagstone path was create to connect the front walkway with the driveway. The bench was adjusted a bit to line up with the flagstone hardscape, and the flagstone was filled in with Mexican pebble. New plants with color were added, along with a mulching refresh of the planter. In the pool backyard space, we added landscape color to a tropical paradise. A pile of rock and pool debris was cleaned out from the corner and super huge Birds of Paradise plants were installed. Red Sister Cordyline and long-leaf acorus gramineus were planted to fill out the circular area beneath a palm tree. Fire red and orange crotons were strategically placed along the perimeter for some eye-catching landscape color. Beautiful additions to a detail-oriented homeowner’s dream escape!